New York (10th November 2014) - Saint Lucia has formalized diplomatic relations with the Republic of Mauritius. 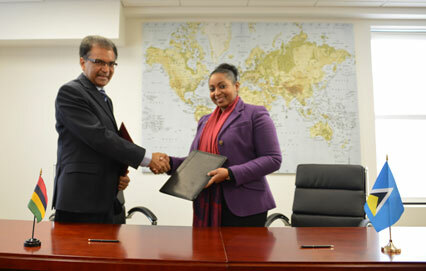 On November 7th, 2014, Ambassador Menissa Rambally, Permanent Representative of Saint Lucia to the United Nations signed instruments with her counterpart Ambassador Milan Jaya Nyamrajsingh Meetarbhan. The agreement aims to promote relations of friendship and cooperation between the two sides in the political, economic and cultural spheres at the national and international levels. This latest formal solidification further exemplifies Saint Lucia’ diplomatic engagement with non-traditional partners; which is critical in building mutually beneficial partnerships to address Saint Lucia’s interest in the context of an ever evolving global environment. Ambassador Rambally in her remarks at the ceremony thanked the Government and People of the Republic of Mauritius and in particular H.E. Mr. Milan Jaya Nyamrajsingh Meetarbhan for bringing this process to fruition. She outlined the bonds that serve and unite both countries citing the many commonalities that existed between the two countries, both historically and presently. Ambassador Mr. Milan Jaya Nyamrajsingh Meetarbhan on his part cited that while geographically our countries are distant, we share similarities as developing countries including sharing similar culture like our Creole Heritage. Ambassador Meetarbhan stated that this signing was desirous of promoting mutual understanding and strengthening the friendship and cooperation between the two countries. The establishment of diplomatic relations between the Republic of Mauritius and Saint Lucia continues to give expression to Saint Lucia’s goal of deepening our relationships in the international community particularly with developing countries such as ours.